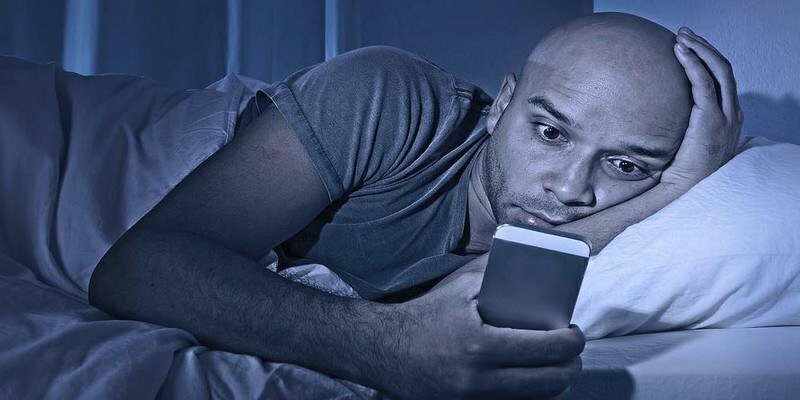 Did you know that too much exposure to blue light can damage light-sensitive cells in the retina? If the damage is severe, it can lead to macular degeneration that eventually leaves you blind. 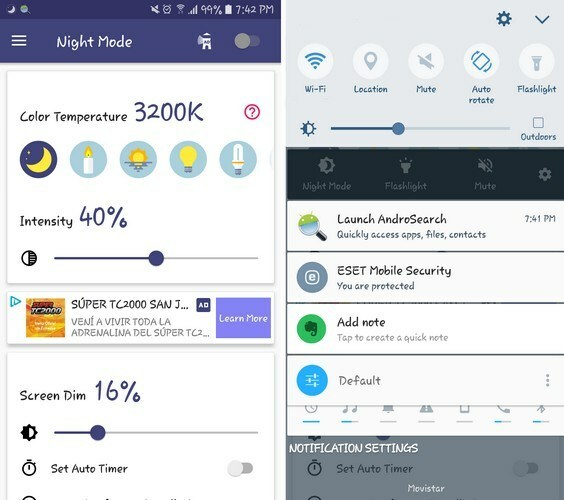 There are various night mode apps for Android that can help you block that harmful blue light. 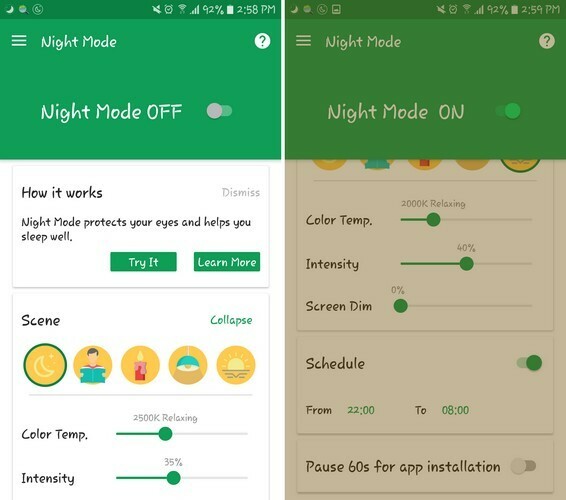 These apps will reduce the blue light intensity at night so you can read and sleep better at night. Not only does Night Mode have an attractive design, but it also offers various night mode options. For example, you can choose from different filter intensities such as 3200k, 1800k, 2000k, 2700k, and 3400k. The app also has a slider where you can adjust the filter intensity manually. You can also dim your device’s display directly from the app with the built-in slider. With the auto timer feature, the app will activate the filter automatically at the times you’ve specified. If you prefer to turn on the filters manually, it’s a good idea that you turn on the notification bar option for easy access. Night Mode offers different filters for different scenes. If you’re not happy with the current adjustments, just move the sliders to your liking. There is also a schedule feature, so the filters are only on between the times you want them. 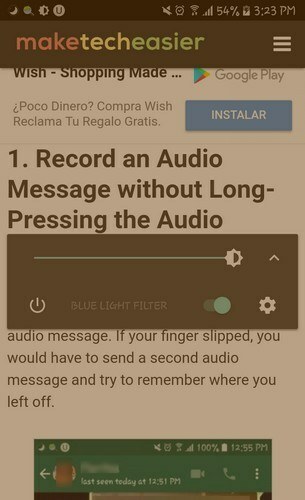 Tap on the Pause button, and the filters will be removed for sixty seconds while you install an app. You’ll see how much time is left since the app will display a countdown clock. The app won’t bombard you with unnecessary features since it only offers the essential ones. Night Shift starts off with a brief presentation of how harmful blue light can be. If you don’t want to go through the presentation, you can tap on the “Skip” button. If you go pro, you can dim above 80%, add multiple schedules, use dark themes, get early access to new features, a lifetime of free upgrades, and go ad-free. It’s also possible to create your filters. Tap on the plus sign in the orange circle and start building. You can adjust the intensity and dim the filter as much or as little as you want. The filter you create has red-ish or green-ish (to mention a few) tones to it. By tapping on the pencil icon, you can also edit the pre-existing filters. Twilight is the most popular night mode app on the list with at least five-million downloads. This app does offer a large variety of options when it comes to filters. Under the filter times section, you can either have the filters on always, from sunrise to sunset or use the slider for custom filter times. If you tap on More Settings, you’ll access features such as auto-pause, notification bar setting, various filter settings, start filter on boot, and more. 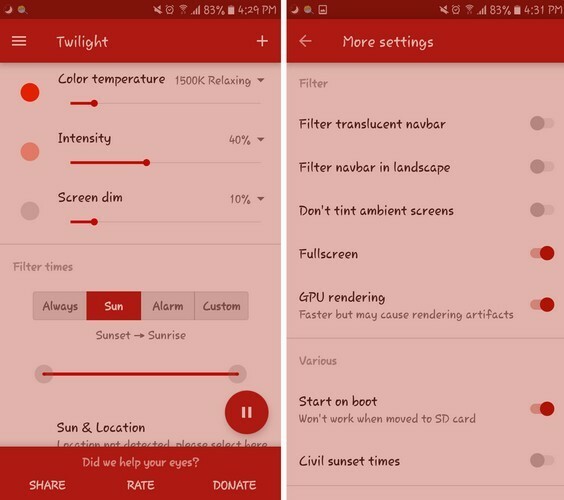 Twilight also offers a useful widget that gives access to filter intensity, screen dim, and settings. Dimly keeps things simple with a popup that allows you to make changes. You can access Dimly either by tapping on the app icon or through the notification bar. If you want to access it through the notification bar, you will need to tap on the cog wheel to go to Settings. “Ongoing notification.” After that, you’ll be able to turn Dimly on through the notification bar. While you’re in settings, you can also set the minimum/maximum brightness and set stop time. By going Pro, you can also unlock auto-start and remove the ads. 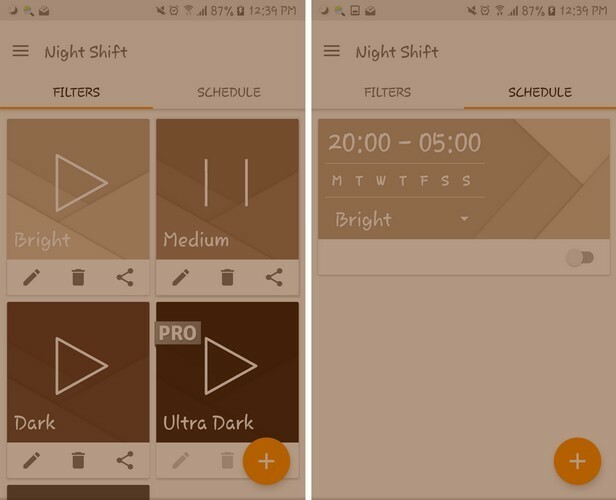 With these night mode apps you’ll help keep your eyesight safe and avoid any damage. All of the apps are free, but some have in-app purchases. Which one do you think you’re going to try out first?